Frank Ocean to Travis Scott No. 1 Album or Not ... Remove Me From 'Astroworld'!!! Sad about Drake and Meek Mill squashing their beef? Don't worry ... Frank Ocean and Travis Scott have you covered, 'cause they're at each other's throats over a track on "Astroworld." 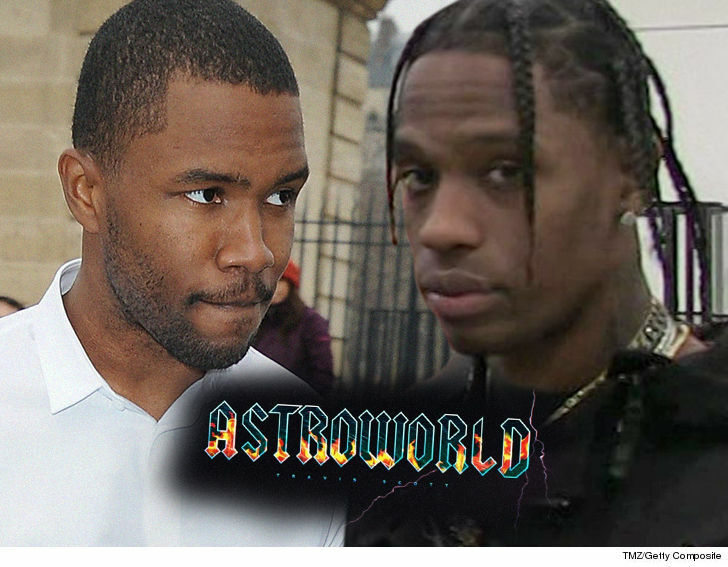 Sources close to the singer and rapper tell TMZ ... Frank and Travis started beefing in the weeks leading up to the August release of Travis' "Astroworld" album, which immediately shot up to No. 1 on Billboard. The beef's about "Carousel" featuring Frank. We're told Frank's PISSED because his vocals -- featured in the chorus and third verse -- were changed. It's unclear what changes were made. Frank's voice includes Auto-Tune ... and his pitch is noticeably higher in the third verse than in the chorus, but we just don't know what's got Frank so upset. Here's what we do know -- Frank's rage has been so real he's been demanding Travis remove his part in the track, but to no avail. Our sources say lawyers are now involved. We're told Frank's legal team fired off a cease and desist to Travis' team to remove him from "Carousel" ... OR ELSE! For his part, Travis hasn't flinched. We're told the rapper has ZERO plans to remove Frank from the track ... which has received critical acclaim from just about everyone.